The Humana Building, also known as the Humana Tower, is a skyscraper in downtown Louisville, Kentucky, located at 500 West Main Street. 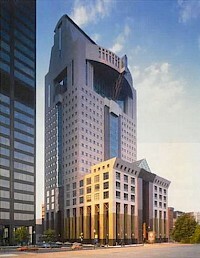 The 27-story structure is headquarters of the Humana Corporation and known for its postmodern architecture. It was designed by Michael Graves. Construction began in October 1982 and was completed in May 1985. Each side of the building is designed slightly differently, up to a sloping pyramid style for the upper few floors.